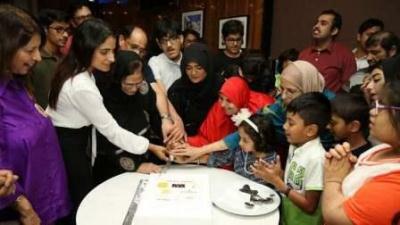 About 100 determined ones and their families were treated to a special Iftar gathering organised by a women's group in Dubai. The Iftar and dinner menu was prepared in accordance with the likes and dislikes of the determined ones. There were also an entertainment package - talent show, henna session, lucky draw and a cake-cutting session. Exclusive lucky draws held for children of determination had prizes which included gold bracelets from Liali Jewellery, special toys and chocolates from Dar Al Ber Society, 100 books from Booktopia, exclusive calligraphy painting by Inam Amroohi, gift hampers and meal vouchers from C House Milano restaurant. Juhi Yasmeen Khan, founder of JYK brand and Women Helping Women group, said: "I am passionate about the welfare of the people of determination and my aim is to help them become part of the mainstream society. For the past 22 years, I have been organising Iftar for them and their families. I call this Iftar a 'Special Iftar' as that's the idea - to make them feel special, especially during the holy month. Juhi added that since she wanted the determined ones to feel part of the mainstream society, she invited people from different walks of life like media personalities, business people, socialites, etc. "The idea is that people of determination should not be segregated, they have to be integrated with the mainstream. This not only helps in making the people of determination feel confident, but, it also helps people interact with the determined ones, know about their life, happiness, problems, challenges and aspirations. And, in case the people of determination need any help/assistance, the whole society can help them without the involvement of any institute or person," said Juhi. Hanifa Salim, mother of two determined ones and supervisor at the Special Family Support group, said: "All children in our group wait for this Iftar as they have grown up meeting up at this Iftar every year. This is not only a lovely reunion for us but also our children get to meet different personalities from all walks of life who motivate and inspire them to rise above their disability and make a mark. This is one Iftar which is no less than a pampering session for my children, both in their 30s. They are just allowed to be themselves and are showered with so many gifts that truly make them feel special." Nidhi Bhojwani, managing director, C House Milano restaurant, said: "It is a privilege and a joy to be involved in this special Iftar dinner. It was a great opportunity given to our restaurant to serve special cuisine through this special Iftar and as Ramadan brings a feeling of goodness, caring and sharing I am delighted to be a part of this special Iftar and be a part of such a noble cause"